This site is to provide a central access point to everything going on in our family's life. We want to share stories, laugh at jokes, learn a new trick, and encourage one another to better our lives by cooperating together to form a core-group family. We encourage you to reach out to us and form an alliance. Right now we are going through a lot of trial & tribulation because of Jeremiah's Bone Marrow Failure, but with the help of our fellow humans, and our closest and dearest friends, we know that we will pull through this time in our life and make way for a whole new chapter in all our lives. Help ease our family's financial stress during Jeremiah's Bone Marrow Transplant & subsequent recovery. He will be unable to work for 6-12 months, and Brook will need to be with him 24/7 during this period. Would you speak with your family and make a decision to help ours? Jeremiah Ilges received his award alongside colleagues from around the world. 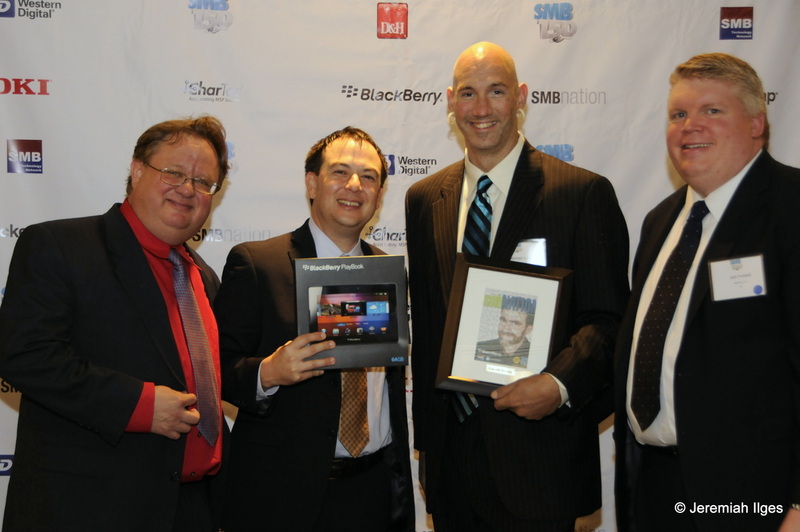 Ilges received the SMB Top 150 award for being an influencer in the SMB space and for his dedication to the continued ethical growth and innovation within the technology industry. 120 of the 150 World-wide winners attended the SMB 150 event in downtown LA this past Wednesday. The traveler with the longest trip being "Wayne Small", from Australia.